AZL’s first diesel brass release since 2003 is here! AZL is offering the Krauss-Maffei ML-4000s in the D&RGW and SP cab unit versions. In the 1960s, The Denver & Rio Grande railroad and the Southern Pacific railroad were looking for larger more powerful locomotives. When US manufacturers failed to deliver options, these railroad turned to German locomotive manufacturer Krauss-Maffei for a solution. Krauss-Maffei would deliver a 3,540 horse-power, six-axle locomotive, the ML-4000. These were diesel-hydraulic locomotives which were a new concept for US roads who were accustomed to electric traction motors to power the locomotives. They were powered by two Maybach MD870 V16s four stroke diesel engine. The locomotive were turbocharged and couple reach a maximum speed of 70mph. The Rio Grande and Southern Pacific worked together on the first order of six locomotives. This was done to meet the minimum required by Krauss-Maffei. Three of each would go to the two railroads. The locomotives were delivered in 1961. The prototypes were 65′ 11 5/16″ in length. Each locomotives weighed approximately 344,000lbs. The first six locomotives were built with a cab unit. 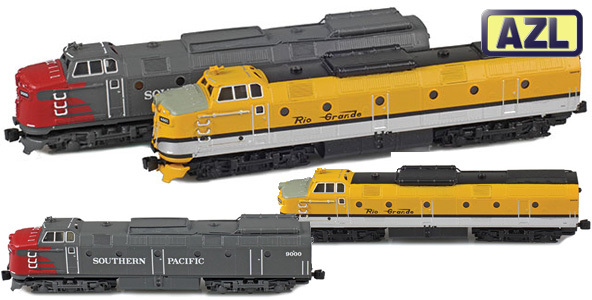 The Rio Grande’s three locomotives were numbered 4001-4003. The Southern Pacific three locomotives were numbers 4000-4002. There were visible differences between the D&RGW and SP versions. In 1963, the SP would order an addition fifteen units. These would arrive in the hood unit style. The locomotives were numbers 9003-9017. The D&RGW’s three Krauss-Maffei were deemed unsatisfactorily for the rugged mountain roads and were sold to the SP in 1964. The SP would renumber these 9021-9023.The SP also transitioned their units away from mountain roads and used them primarily in the non-mountainous routes of California. By the late 1960s, American locomotive builders had come up to speed. The SP started ordering SD40s and SD45 from EMD. In addition, General Electric started offering their U30C and U33Cs series of locomotives. By 1968, the Krauss-Maffei’s were retired. All were scrapped by the end of 1968. Today, only one Krauss-Maffeii exists. It is number 9010 in the hood unit style. This locomotive is currently going through restoration to bring it back to life. AZL’s brass versions are limited edition. The total run is ninety-units. Ten of each D&RGW are being offered, and twenty-of each SP unit. Each unit comes with a spare front truck with plow and coupler. The locomotives feature directional LED lighting and AZL’s AutoLatch couplers.